It is, perhaps, its location rather than any history or tradition that draws people to Ffynnon Eidda. Several correspondents recently have suggested that I visit and it always was on my to do list anyway. So last weekend we headed off up the steep climb onto Snowdonia’s Migneint moorland from Ysbyty Ifan. Trickily we chose the day of a massive cycle race and had to dodge upwards of 800 cyclists hurtling downhill towards us as we drove. 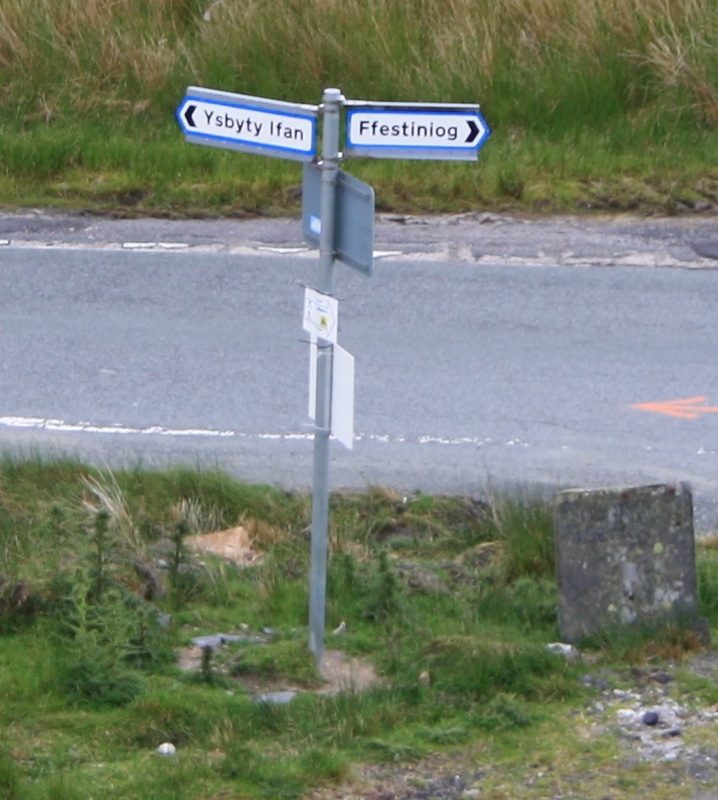 Ffynnon Eidda lies around 1500 feet above sea level at a road junction on the B4407 between Ysbyty Ifan and Ffestiniog. It is indeed an impressive structure, standing out on the edge of bleak peat bog moorland. The spring basin, some two feet square is roofed and provided with an entrance enclosure with stone seat. The water is supposedly cold and pure, good to drink, though today it was rather murky, full of pond weed and not all that appealing. The bottom of the basin was covered with coins, evidence of the regularity with which passers by must stop. The front of the housing bears a number of plaques recording the name of the well, its rebuilding in 1846 and the motto “Yf a bydd diolchgar “ – drink and be grateful. The well is recorded as a drover’s well, used by the cattle once driven over this pass, heading towards the A5 and away to England. Beside it is the remains of a banked and ditched enclosure which may have been associated with either the spring, maybe a cattle pen used as a stop off point by the drovers or with the farm which once stood close by. 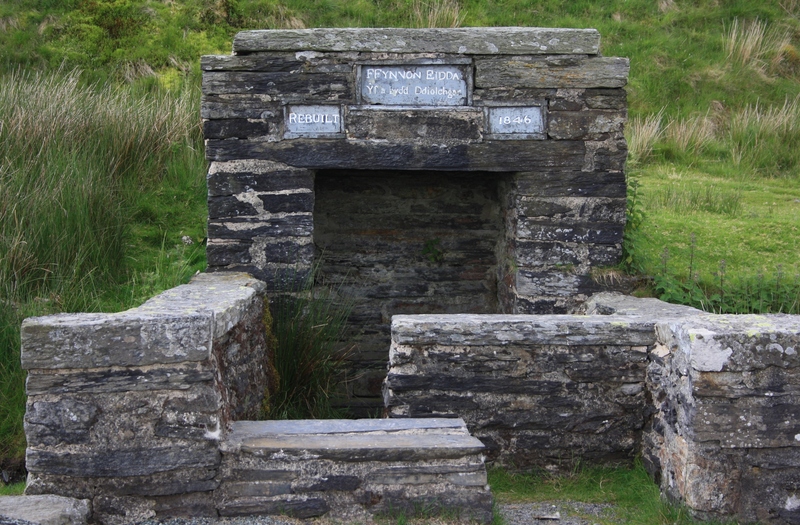 The well would have represented a landmark and a convenient resting and refreshment point on the difficult path between Ffestiniog and Ysbyty Ifan – from observations during our visit it still performs a very similar function today . It is marked and named on the OS maps back into the nineteenth century. 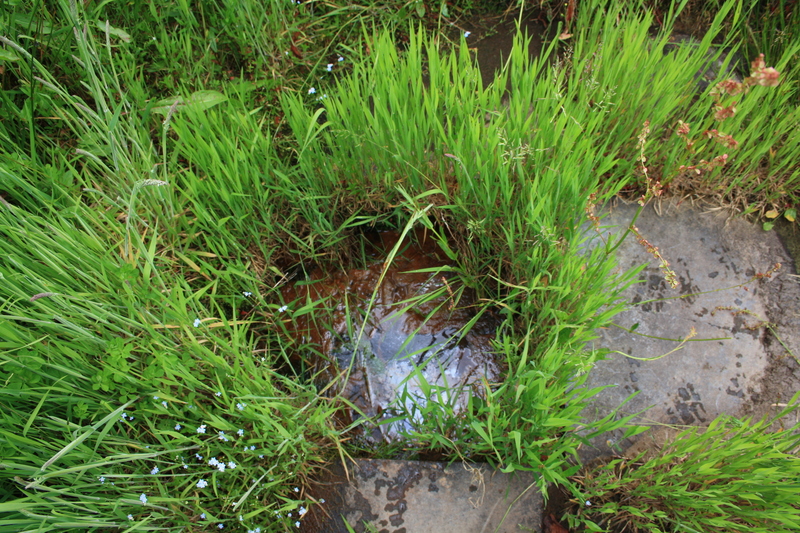 There is little record however of any wider significance of the well, although the Cymdeithas Ffynhonnau Cymru website does suggest that it may have been considered to have beneficial healing qualities at some time. Regarding the derivation of the name, Eidda appears associated to a few geographical features in the area and appears to be derived from the place name, Eidda being a small township to the west of Ysbyty Ifan. Thomas Pennant crossed the route in the 18th century. He describes his journey through the “black and moory mountains” to see nearby Llyn Conwy, and although he would have passed the well he fails to mention the factm suggesting that at that time it was not considered significant. Heading back down into Ysbyty Ifan we passed the final stragglers of the cycle race and, at the roadside entering the village, another stone walled and roofed well. 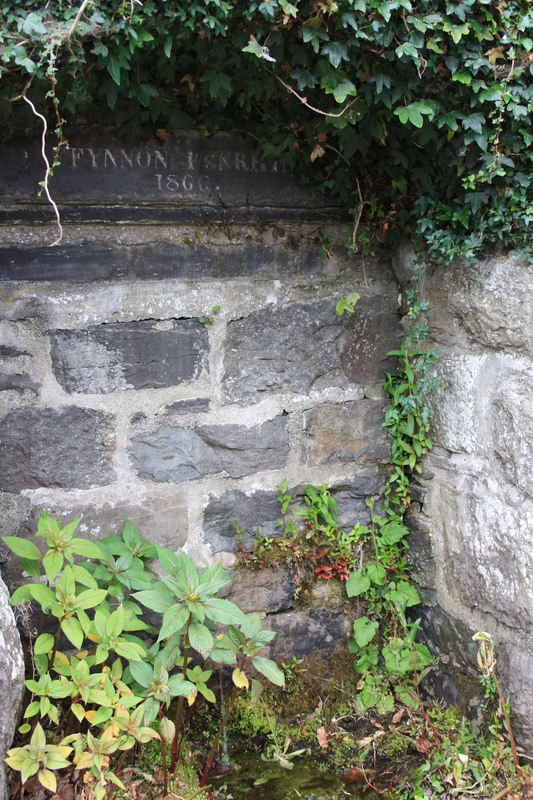 This is Ffynnon Penrhyn, which has no claim to fame other than being an old village water supply. It too has its name and date, 1866, carved in the stone surround. It is fed by a metal pipe in the back wall through which the spring water still streams. Parking outside the church, once the site of a medieval hospital run by the Knights of St John, which gives the village its name, we walked up to a third spring. This is the only one we saw today with any real claims towards healing properties. 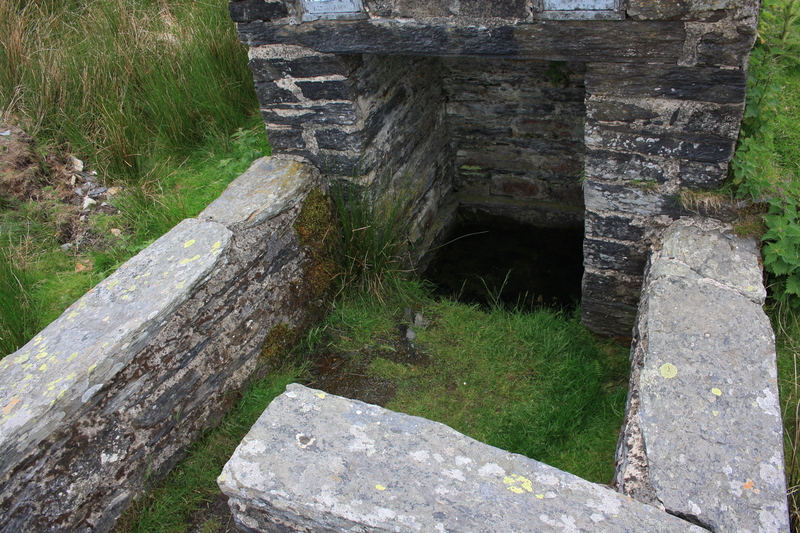 This is the chalybeate and sulphur well above Tŷ Nant. Until around 1910 the well was enclosed in a wooden hut with seats around for visitors. 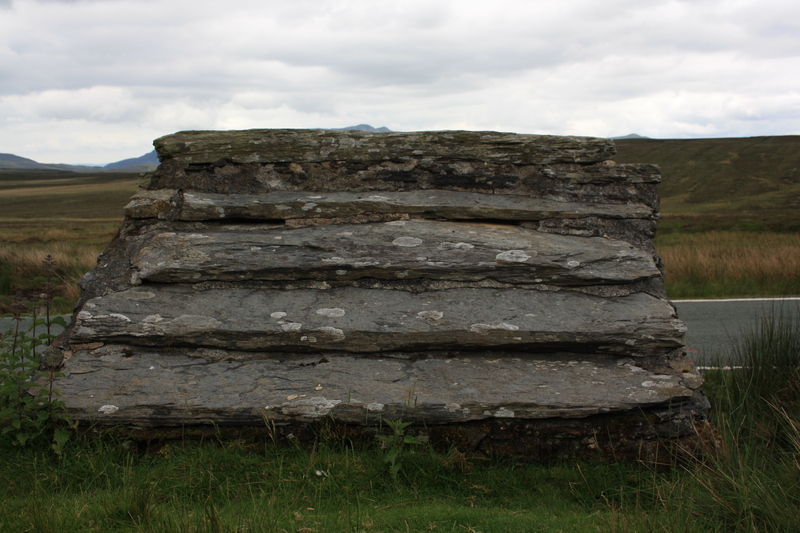 Any remnants of the hut have long since vanished together with a wooden cover that used to protect the well. However, the slate floor remains giving an indication of the size. At one end there is a bath, with stone sides and bottom, into which the spring water is piped. The outflow runs away down the hillside, the dark brown colour characteristic of the iron rich chalybeate water once so valued as a cure. 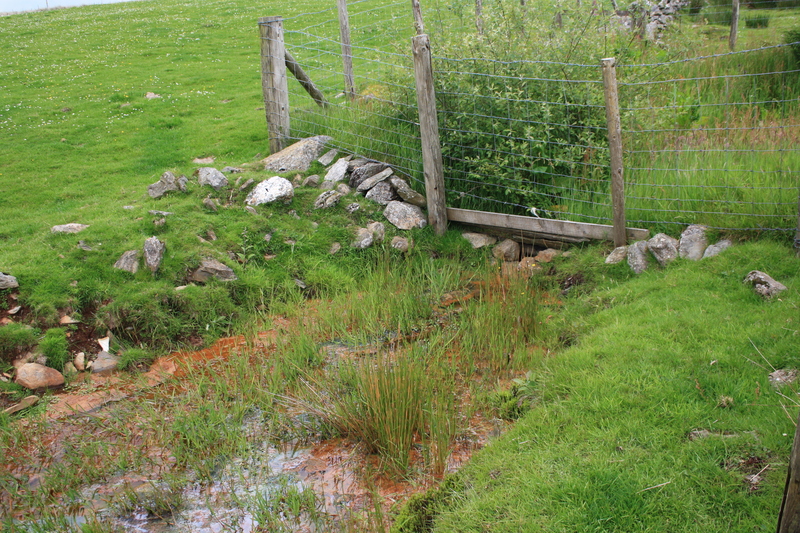 The mineral content is supposed to be very similar to that of the much more well known Trefriw spring. It is recorded that this well was much resorted to up to the 20th century, Children were sent to soak warts in the basin and bottles and tins of spring water were taken away for drinking. Aching legs and feet would be soaked in the ice cold mineral rich waters. Up to the early part of the twentieth century it was a popular meeting place for people of the village on Sunday afternoons an summer evenings. The name of Ysbyty Ifan itself bears testament that it has long been a place of healing. In this case it was a hospital rather than a saint’s well that provided the focus and the cure. Our visit still found a couple of wells of note, and their condition and the settings made them well worth a visit. Reference has been made to two articles in Llygad y Ffynnon, the publication of Cymdeithas Ffynhonnau Cymru, in issues from Christmas 2011 and Summer 2010.